Makaronia me Kima is one of the easiest Greek recipes. When someone who has never cooked before decides to start cooking, I bet that they always start with this dish and fried potatoes:) It is easy, only a few ingredients are required, it is quick to prepare and it is so tasty. This is probably why it took me so long to post about this recipe. I thought that everybody can make this recipe, so at the beginning of blogging I took a few photos but never posted about it as I had more interesting recipes to post. However, I think that even for those few persons who will now start cooking it is worth while to add this recipe. Some times I make a vegetarian version of this recipe and don’t add any meat in it. Sometimes I add mushrooms, sometimes I keep it plain, and make a lovely tomato sauce to top a spaghetti dish and make sure to make double the recipe as I use the remaining to make pizza. Bring plenty of water to boil and add salt as well as pasta and boil according to directions on package. I boil them for not more than 6 – 7 minutes, stirring occasionally. If pasta is prepared ahead after boiling drain pasta and add cold water but it is best to do this just before you are ready to eat. In a medium sized sauce pan heat the olive oil and sauté the onion for a few minutes. Add the garlic and sauté until translucent. Add the ground meat and sauté until it becomes white. Add the wine and mix until the alcohol evaporates. In a food processor puree the tomatoes together with tomato paste and carrot. Add it to the minced meat together with salt, pepper, oregano, basil and cinnamon stick. Add water and bring to boil. Lower heat and put the lid on and simmer checking it and stirring occasionally until the sauce thickens. 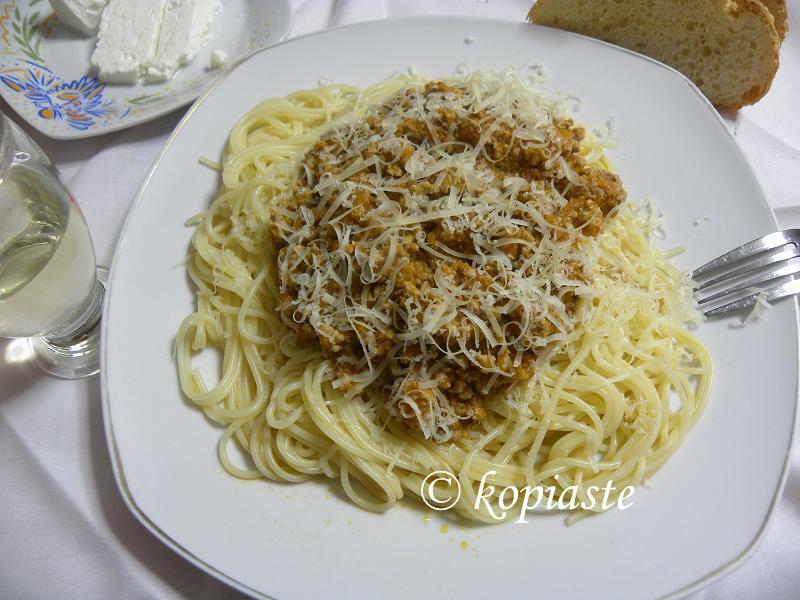 Serve sauce on top of spaghetti with aged myzithra or kefalotyri. Leftover sauce can be used as a base for your pizza. “Makaronia me kima” is a winner for me all the time Ivy! I absolutely love this dish…glad you posted your version of it. Thanks Peter, I forgot to mention that we call them Makaronia me Kima. Shall correct this. Ivy you are so right, spaghetti bolognaise was my first dish my mother taught me how to cook! Your’s looks delish! This is really similar to the Italian way we made our bolognese sauce, Ivy. It looks so satisfying. good you posted it …..i was not very sure of wine..now it makes it clear..thank you. Anamika, some add wine, some do not so if you don’t like wine just skip it. Deeba, you are right. We cannot know everything in other cuisines and even a simple dish maybe something we have never tried before. Regarding keema, that how we call it in Cyprus it is pronounced keimá and in Greece we call it kima. Ivy, I made this for dinner tonight and it was lovely! I only wish we had Greek cheese here in Japan where we live. Your suggestions for cheese to go with it made me drool! Thanks for the recipe. I’ve been to many countries around the world but Greece was my favorite for food! Abigail, welcome and thanks for visiting. I am convinced that there is a purpose for everything we do and posting this recipe after so many months, I believe this post was meant for you. Glad you enjoyed it. Thanks for sharing this one with Presto Pasta Nights. Hi Ruth. Lasagna at the age of 16. Very impressive. Lore, you’re right. I forgot about scrambled eggs (who can go wrong with that) and omelets. Yikes! I’ve just realised I’ve become so stuck in a rut that I have never even thought of using white wine with mince. For some reason it got stuck in my brain to use red wine with beef, but I should really try white wine sometime. Thanks for reminding me! Its worth adding because its great to see everyones variations on this staple. Now you’ve put me in the mood to make this again!